One way to protect yourself against a bed bug infestation is to invest in mattress encasement. Not only will it protect you against bed bugs, but it can also help with skin rashes and breathing problems by protecting against allergens and other irritants. We researched the best brands and highest rated products available to put together our best bed bug mattress encasement reviews to help you find the right one. Before we get started, let’s look at some key things to consider. Bed Size: There are mattress encasements for every size bed available because everyone deserves to be bed bug-free. Most of the products we researched were queen sized but there are a few twin and full sized ones, too. Waterproof: Most of these encasements are waterproof, which means they can protect your mattress from small spills or unfortunately overnight bedwetting incidents. That said, anything wet should be cleaned up as quickly as possible as it could eventually seep through. Zippered: All of the products we chose are zippered and for good reason. It’s the easiest style to get off and on which comes in really handy when it’s time to toss the cover in the washing machine. Pocket Depth: This is basically the height of the mattress that will fit inside the encasement. Some mattresses are pretty tall these days with pillow tops and multiple layers. It’s important to know the height of your mattress before you buy. Hypoallergenic: Hypoallergenic encasements are perfect for anyone who suffers from allergies, asthma, eczema, or dry skin. Blocking contact with any allergens or triggers can really help you sleep better and wake up rested and healthy. Warranty: All of these products are covered by some kind of warranty. They range from 5 to 10 years though we did find one that was only covered for 30 days and one with a limited lifetime guarantee. Now that you know a little more about mattress encasements, let’s move into our top picks. If you’re in a hurry, take a look at our top and budget picks to get a good idea of the range that’s available. We put the right at the top of the list so they’re really easy to find. Keep reading if you can stick around, all of these products are worth a closer look. Are you ready? Let’s get started. 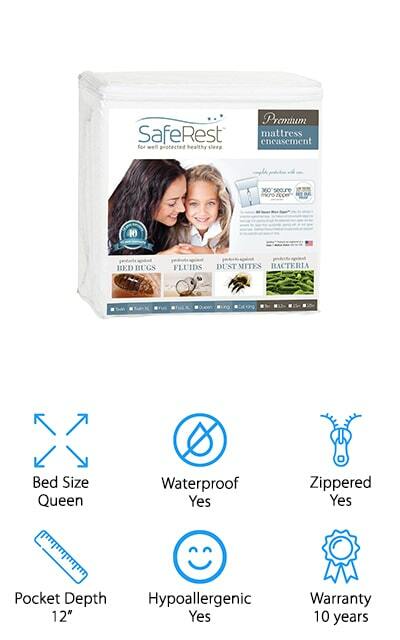 Our top pick for bed bug mattress encasement is the SafeRest Bug Cover. One reason why this one made it to the top of the list is that, in addition to protecting your from bed bugs, it’s also designed to block allergens, fluids, and dust mites. Bed bugs can fit through even tiny spaces which is why the micro zipper technology and the secure velcro flap are so important. The zipper’s teeth are very small and fight tightly together to make sure that nothing can get through. A soft cotton terry cloth surface was designed to be soft, smooth, and quiet so there’s no disruptive rustling while you’re trying to sleep. Plus, it’s naturally absorbent and allows air and heat to pass through to keep you cool and dry at night. If you’re looking for a cheap bed bug mattress encasement, our budget pick is a great choice. This thin, quiet cover creates a nice sleeping surface that’s soft and doesn’t crinkle or feel like plastic. It covers all 6 sides of any mattress up to 12-inches thick and has a convenient zipper closure. The hypoallergenic surface is breathable to help you stay cool and it’s so thin, you might not even know that it’s there. This is also a great one for kids because it also protects it from spills and other accidents. 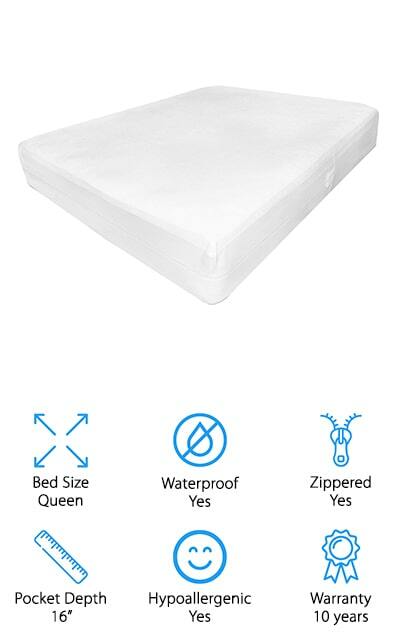 The 100% waterproof backing protects your mattress from all liquids plus you can just take it off and throw it in the washing machine when it gets soiled. That’s not all, it’s even covered with a generous 10-year warranty. This Hospitality Mattress Encasement is made of 100% polyester knit material and can fit mattresses as thick as 18 inches. 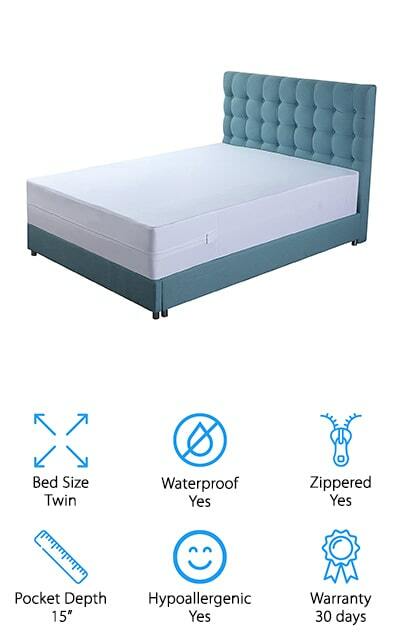 It features a 100% waterproof barrier that protects all 6 sides of the mattress and uses a convenient zipper closer so that it’s easy to remove when it comes time to wash it. Not only is the material breathable, but it’s also hypoallergenic which makes this a good choice for anyone with allergies or asthma. This cover is really durable, too, thanks to the extra-tough seam construction, high-thread count fabric, and a waterproof layer that’s a full 1mm thick. Plus, it’s covered by a 5-year warranty. One more thing, this product contains no vinyl, PVC, phthalates, or fire retardant coatings of any kind so you can be certain you’re not breathing in anything that could be potentially harmful. A great twin bed bug mattress encasement that’s perfect for kids is the Utopia Bedding Mattress Cover. 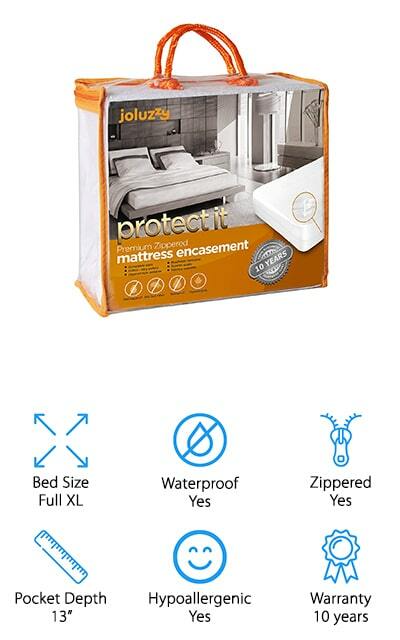 The zippered cover features zip guard technology to seal the mattress all around and prevent bed bugs from entering or escaping through even the tiniest of spaces. This knitted polyester encasement stretches to fit mattresses as thick as 15-inches and the waterproof TPU backing prevents any spills, leaks, or accidents from soaking into the mattress. Just in case it does get soiled, clean up it easy. Just toss it in the washing machine and tumble dry. The surface is breathable, too, and allows moisture and heat escape so you get a cool, comfortable night’s sleep. You won’t hear any plastic crinkling noises when you roll over at night and the soft surface is very comfortable to sleep on. Up next in our list of best bed bug mattress encasement sets is this one from SureGuard. The super fine zipper features InviziZip and SureSeal technology so that your mattress is completely sealed off from bed bugs. Not only is this cover bed bug proof, but it’s also a great barrier for protection against spills and accidents because it’s 100% waterproof. The top is made of cotton terry which is really comfortable and very effective at wicking away moisture. One of the best things about it is that it actually retains the feel of your mattress. It doesn’t feel or sound like plastic and allows air to flow through, keeping you cool and comfortable and blocking out things that can cause allergies and breathing problems like dust mites, pollen, pet dander, and even mildew and mold. 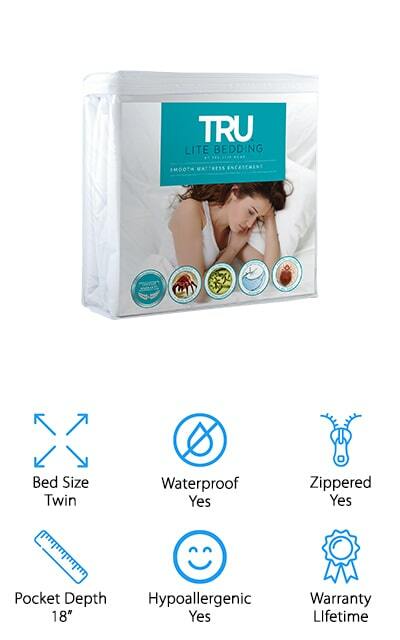 A great plastic bed bug mattress encasement is the TRU Lite Bed Bug Mattress Cover. It feels like plastic interwoven with cloth and won’t change the feel of your mattress. This cover is quiet and cool and locks out bed bugs as well as allergens, dust mites, and other bacteria and germs. That’s not all, it also locks out mildew and mold which can lead to bigger problems in the future. 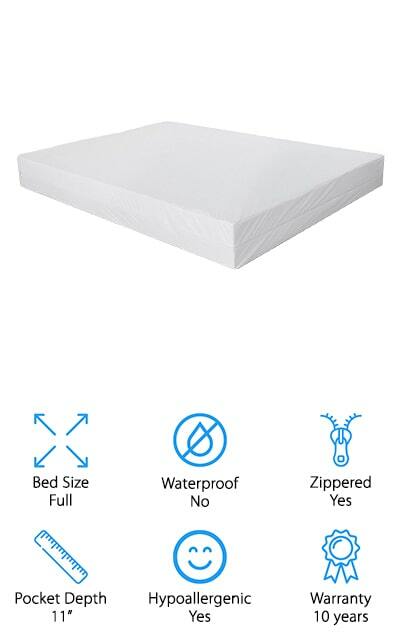 To protect your mattress from spills and other accidents, it’s 100% waterproof which makes this a great choice for young children who are still prone to having accidents during the night. Cleaning it is easy, too. The zipper allows you to get it on and off quickly and easily when it comes time to toss it in the washing machine. 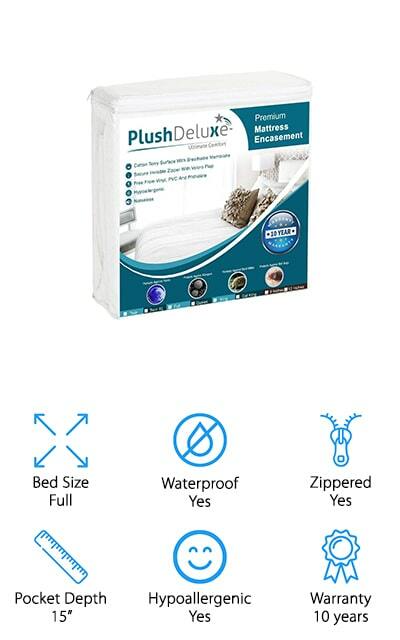 The PlushDeluxe Mattress Encasement is a top rated bed bug mattress encasement that has a soft cotton terry surface that’s not only really comfortable to sleep on but also noiseless and free of vinyl, PVCs and phthalates. This is also a good choice for anyone with allergies or asthma because it’s hypoallergenic and also protects against dust mites, allergens, and bacteria. The 100% waterproof lining repels fluids of any kind while still allowing air to pass through to keep you cool and prevent any night sweats while you sleep. If it does get soiled, just unzip the convenient closure and toss it right into the washing machine. This encasement comes with a 10-year 100% satisfaction guarantee. If you’re unhappy for any reason, simply return it within this time frame for a full refund. Up next is the Everest Mattress Encasement that fits an 11-inch tall full-size mattress and can also be used as a box spring encasement. One of the great things about this cover is that it’s the same on both sides. That means that you can flip your mattress without having to worry about changing the cover. It’s made of stretchy, strong fabric for long-lasting durability. 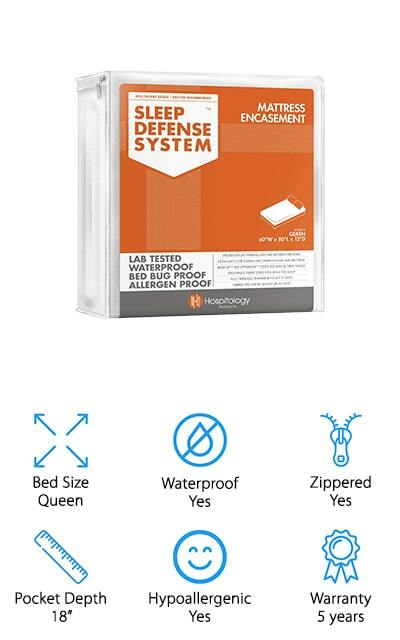 This cover keeps bed bugs out with a premium zipper on 3 sides as well as end velcro patch to make sure that there are no gaps for them to slip through. 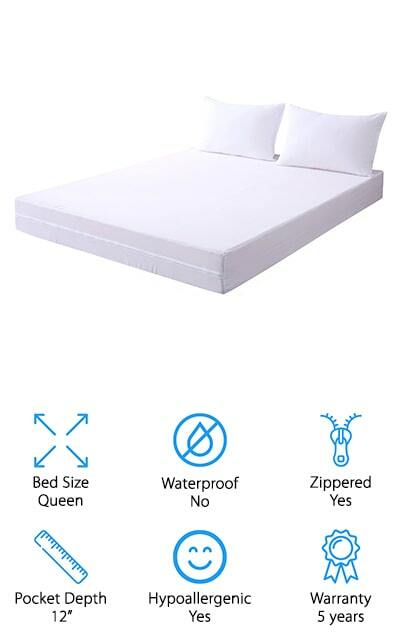 This encasement is breathable and comfortable to sleep on plus it doesn’t make any plastic crinkling noises when you roll over in the middle of the night. Plus, it’s hypoallergenic and ideal for people with asthma, eczema, or respiratory conditions. This soft, breathable mattress encasement from Downcool features a luxurious surface made of a blend of polyester and nylon. In addition to keeping you cool at night, this cover is also quiet so you don’t have to worry about waking up your partner if you turn over in your sleep. That’s not all, it’s also water-resistant and doesn’t have any of the plastic smells that some other encasements do. It’s pretty easy to get on thanks to the simple zipper opening and covers mattresses up to 12-inches thick. The binding techniques used on the inside prevent bed bugs from passing through even the smallest gaps between the zipper teeth and also keeps away dust mites, bacteria, and allergens. It comes with a 100% satisfaction 5-year warranty and also includes 2 matching pillowcase covers. 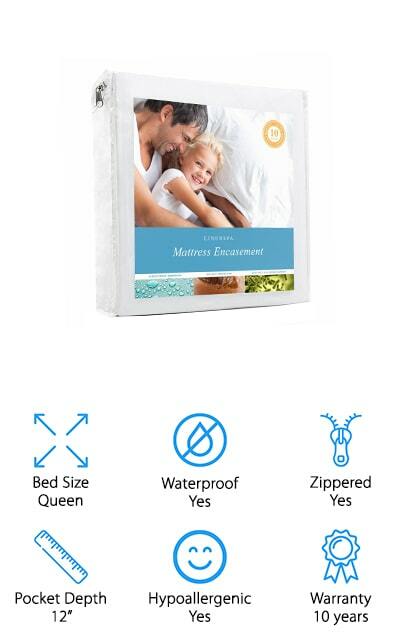 Last but not least in our bed bug mattress encasement reviews is the joluzzy Zippered Mattress Protector. It protects against bed bugs, dust mites, allergens, and bacteria. This material is hypoallergenic, too, which makes it great for anyone with breathing problems like asthma or who suffers from eczema or other skin conditions. It’s breathable, soft, and comfortable plus the terry cloth surface is breathable and helps wick away moisture so you can get the most comfortable sleep possible. The polyurethane backing makes this material waterproof and a good choice for a kid’s bed. It protects against any spills or bedwetting accidents that can happen overnight. This zippered style protects your mattress on all 6 sides and is easy to remove and toss in the washing machine when it gets dirty.